Using ArcGIS 3D Analyst, 3D elements from internal and external sources were integrated for a proposed tramway project. 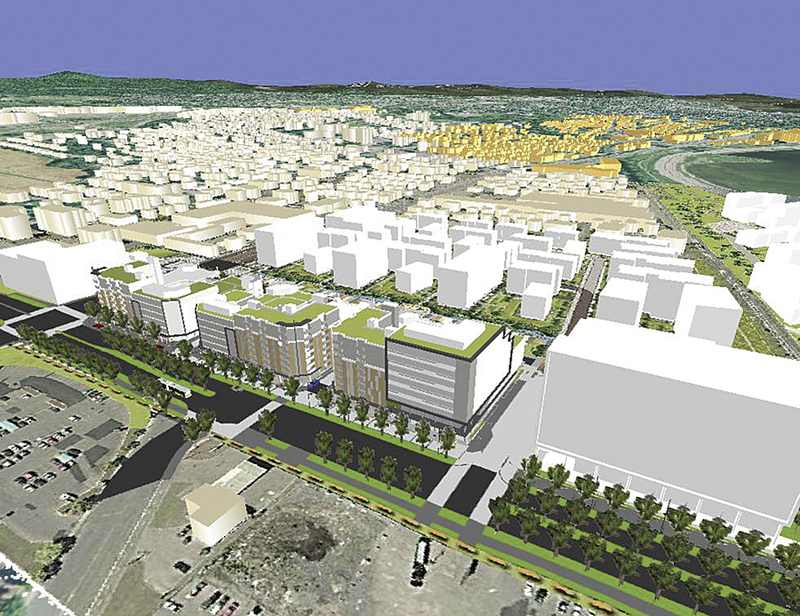 Visualization in 3D during public consultations informed neighborhood residents of impacts. Being able to rotate 3D models helps to gain buy-in from stakeholders. The City of Québec is the second largest municipal in the province of Québec, Canada, and continues to grow; its population jumped a remarkable 5.2 percent between 2006 and 2011. The city is also unusually dense, with a population density of 1,137.7 people per square kilometer as compared to an average of 5.8 for the province as a whole. Modeling in 3D provides the city with an indispensable communication tool because it allows anyone to realistically view the impact of proposed construction. Accordingly, city planners are tasked with a complex balancing act that involves developing infrastructure to support continued growth, protecting historical architecture, and promoting a healthy environment. In response, the City of Québec leveraged 3D technology to develop a complete and accurate view of its urban ecosystem. The city uses 3D tools to model risk, assess the impact of proposed new construction, and intelligently plan and design infrastructure that benefits both residents and the surrounding environment. In 1994, the City of Québec created the basis of a 3D city model using 2D footprints and photogrammetry. Fifteen years later, the city recognized a need for something more. Steeve Guillemette, the city's information systems manager, explains, "Only the GIS technician could access and manipulate our data models. This made it difficult for city planners, architects, and other stakeholders to retrieve and use the data they needed to complete their work." To extend access to vital information, in 2010 the city consolidated all its data into a central ArcGIS for Server geodatabase. It leveraged ArcGIS 3D Analyst so that it could analyze 3D models in multiple ways. Through ArcGIS Explorer, the models were then made available to urban planners, environmental engineers, and building management staff online. These models are frequently consulted to measure the impact of proposed construction on existing city assets. For example, shadow analysis enables city planners to measure the impact of proposed buildings on public swimming pools. If it is determined that a new building will cast a shadow that may negatively impact a public pool, the proposed development is relocated. To ensure safety, 3D models of proposed city buildings are also combined with a digital elevation model to measure the impact of new construction on flood risk, particularly within the city's flood-prone areas. Line-of-sight analysis is another key advantage of 3D modeling and is leveraged to ensure that proposed new developments will not impede the view of the famous Saint Lawrence River. Says Guillemette, "3D models provide a perspective that is simply not possible with 2D. You can assess the visual impact of a proposed building from any angle, whether from the street, your house, or the waterfront." Similarly, 3D models are used to maintain visual harmony between new construction and heritage properties. For example, throughout certain areas of the city, buildings can only be a few stories high, and all buildings within the city are subject to energy efficiency standards. When a building is found to contravene regulations, measures are taken to bolster compliance while preserving the building's unique character. Modeling in 3D provides the city with an indispensable communication tool because it allows almost anyone to realistically view the impact of proposed construction from multiple angles and viewpoints. A history of 3D buildings can also be referenced to demonstrate powerful before-and-after scenarios. ArcGIS 3D modeling has proved especially useful for the city's highly publicized $1.5 billion tramway project. 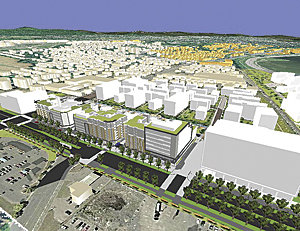 The proposed tramway, currently in its preliminary stage, would connect the suburbs to the downtown core, hospitals, and shopping centers, serving as a hub for the city's public transportation. It would also encourage residential development in the city's core. Using ArcGIS 3D Analyst, the city was able to integrate 3D elements from internal sources, as well as external suppliers, for the entire 27-kilometer network. As a result, system benefits could be clearly demonstrated to both potential investors and the public. A 3D model was also developed to inform the construction of a new recreational arena. Through 3D visualization, building managers were able to develop a comprehensive plan outlining a two-phase approach to construction: the first would focus on the development of an ice rink, and the second would center on building a new soccer field. During public consultations, 3D visualization was used to inform nearby residents of the arena's impact on surrounding neighborhoods. "Unlike a picture, 3D models can be rotated to show impact from any perspective," says Guillemette. "This helps to gain buy-in from a diverse range of stakeholders, including city council; potential investors; and most importantly, our residents." An exciting initiative currently unfolding in Québec is the introduction of Green Neighborhoods. A Green Neighborhood is designed according to sustainable development principles to reduce its overall ecological footprint. It attempts to connect urban sustainability principles with microlevel community planning for the betterment of residents and the environment. The concept has already proved successful in Montréal and several US cities, where this approach to urban design has been shown to reduce greenhouse gas emissions by 20–40 percent. Green Neighborhoods are characterized by a number of features that can include sustainable, energy-saving infrastructure developed using ecological materials; vast green spaces and waterways; the installation of green roofs; minimal distance between homes, shops, and office space; and ecological modes of transportation. ArcGIS 3D Analyst is used to map attributes onto buildings to analyze the impact and efficacy of green initiatives. The city can also determine the overall impact of Green Neighborhoods not only on surrounding communities but also on the city at large. "We used to have visibility only into how a proposed project would affect the area directly surrounding it, whereas now, we can view the citywide impact of our initiatives," says Guillemette. "GIS affords the ability to assess relationships between buildings and the wider landscape, which is critical to the success of all our projects." In the near future, the city plans to extend 3D modeling to its underground infrastructure. It will also model its water plant, sewers, and hydrants to optimize the sustainability of water/wastewater management throughout the municipality. For more information, contact Steeve Guillemette, information systems manager, City of Québec.